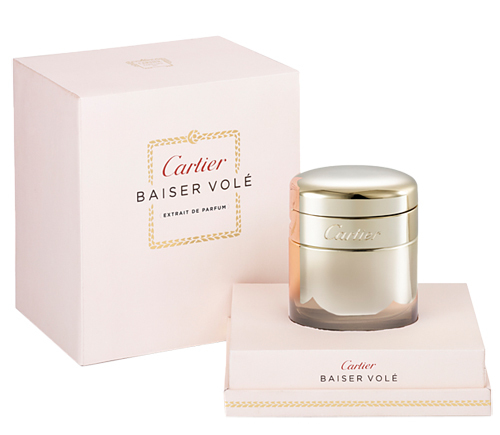 The quite lovely Baiser Volé by Cartier is now coming in an extrait de parfum concentration for the ultimate experience of immersing your head in a fresh,green lily bouquet. Among the prettiest (if not most exciting) releases of 2011, Baiser Volé is now more concentrated in order to cater for indulging our posh genome. The new bottle is shaped like a metal lighter, continuing the tradition of Cartier which began with Must de Cartier (1981). You can read a review of Baiser Volé on this link and information on lily fragrances on this one.You can find a guide into perfume concentrations on this link. 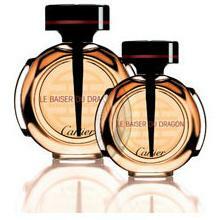 On the other hand, Le Baiser du Dragon, a sumptuous and hold-no-prisoners oriental from 2003 with bitter almond/amaretto notes and jasmine-gardenia in the heart, is getting discontinued. The reason offered is a desire to focus on the more upscale Les Heures de Parfum line in the Cartier portfolio, developed by in-house perfumer Mathilde Laurent.Odd decision, given that the gorgeous name (which translates as Kiss of the Dragon) is used in an orientalised motif inspired jewelry line of the historical house. It's hard to think the recalibrated focus is the only reason, as Délices de Cartier, So Pretty and several flankers on L'Eau de Cartier still are included in the Cartier portfolio, as strongly as ever. We can hypothesize that slower sales than anticipated thanks to the changing zeitgeist have something to do with it (Le Baiser du Dragon shares the fate of similarly smelling Kenzo's Jungle L'Elephant, if so) or possibly restrictions on some or other ingredient making it impossible to recompose satisfactorily (doubtful). Or perhaps a desire to break loose with the old and establish a new identity with nose Laurent on the helm (naturally Déclaration by Jean Claude Ellena is safe, as it's the biggest Cartier seller by several miles). Oh, dear. I'll stop by the perfume shop to sniff Le Baiser du Dragon and see if it's worth stocking up (my position with orientals is usually love or hate). it is pretty, isn't it? I have been contemplating getting a bottle myself. I guess that the reason is really this, because so pretty in all concentrations and delices in edp, parfum and eau fruitee concentrations are being discontinued too. I was shocked when a friend that works in a fragrance store told me about this, it seemed a tough thing discontinuate so many fragrances at once. How absolutely riveting news! Thank you! It totally makes sense now. I thought Delices sold relatively well to be worth it to the company to keep several concentrations afloat (not parfum!) A pity onf So Pretty; it's really pretty and not too juvenile. I thought that all discontinuations were great losses. So Pretty seems to be chic, le baiser a power fragrance, and the panthere was one of the best cousins of dior poison. I guess that, regarding Delices, they only kept the most sold concentration. And you are right about Eau de Cartier and Declaration. It seems that both are important for Cartier. From what i know, they will both earn new versions next year.